Lastly, twist one strong wire into a large loop facing the back top of your cross in order to hang it on your door. 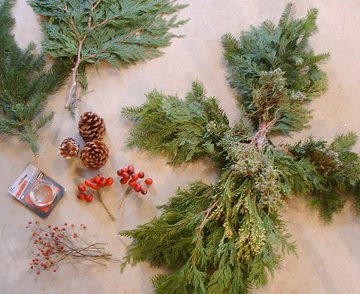 Tip: If your local garden center or boyscout troop make their wreaths on site, ask if they would wire together a cross base for you. Then all you need to do is embellish it! What a beauty. I want to make this! I've never seen a cross wreath before. What a wonderful idea!! This is gorgeous! Thanks for the step by step instructions! I love this creation from you and I want to make this but I'm not sure if we have those materials but I'd probably just use some substitutes for them. You are very talented. Glory to GOD! Thank you so much for being very generous by stating the materials and instructions. Btw, I borrowed the image in this post for one of my posts entitled "Christmas." I linked it to your blog though. Thank you. GOD BLESS YOU ABUNDANTLY! P.U.S.H. You leave me in awe of your creativity and talent. What a great idea! I love it. I'm definitely going to attempt to make this one. Thanks for giving the instructions. You are truly a gifted woman. Praise be to God. What a great place to visit. 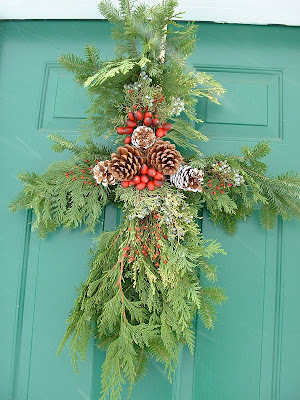 I love the idea of making a cross wreath.